The SoundTouch 300 soundbar offers the best performance, spaciousness and bass of any one-piece soundbar its size. The SoundTouch 300 soundbar delivers clear, spacious sound. Every cubic inch of this speaker is packed with technologies that bring your music and movies to life. It starts inside with custom-shaped speakers that keep the profile low and pump out big sound. Quiet Port technology virtually eliminates distortion so you hear surprisingly deep bass. ADAPTiQ audio room calibration ensures the soundbar sounds the best it can in the space you put it, while PhaseGuide technology makes you believe you’re hearing sounds where there are no speakers. On the outside, the glass top and perforated wrap-around metal grille make the soundbar look as good in your room as it sounds. Bluetooth and Wi-Fi technology are built in, so you can wirelessly stream music any way you prefer, while NFC provides quick and easy pairing. The SoundTouch app gives you simple control over your favorites. And the SoundTouch 300 soundbar works together with other SoundTouch speakers, like a family. You can start with the SoundTouch 300 and add other SoundTouch speakers when you are ready. 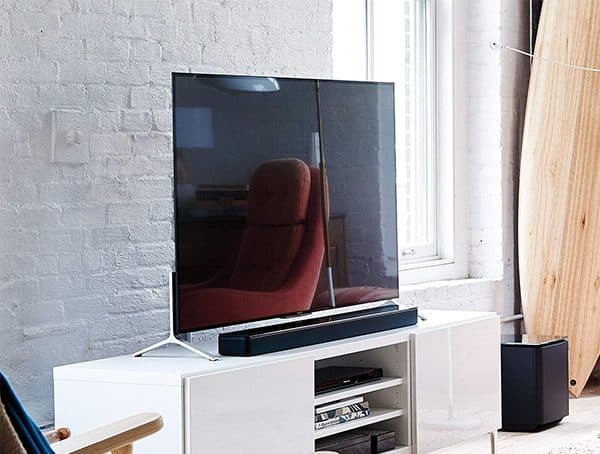 And while the SoundTouch 300 soundbar sounds great by itself, you can add the Acoustimass 300 wireless bass module and/or Virtually Invisible 300 wireless surround speakers at anytime to get even more performance and a full 5.1 experience. Place the soundbar on a table below your TV, or save even more space by using the optional wall bracket. It’s all run by a universal remote, so you can control your other devices, too. • Alexa, play Niall Horan in the Living Room. • Alexa, turn up the volume in the Kitchen. • Alexa, pause the Office. • Alexa, next track in the Bedroom. • Works with Alexa for voice control (Alexa device sold separately).